The fall of the Amin government on April 11, 1979 was greeted with euphoric optimism throughout the country, except of course for his remaining supporters; those who benefited from His regime, the small South Sudanese and Congolese community that were part of his security apparatus and Nubian community that were seen as forming the backbone of the Amin regime. In the days after Yusuf Lule was sworn in as president, his somewhat clueless administration was enjoying its honeymoon, oblivious of what was happening in the countryside as the Tanzanian liberators and their Ugandan counterparts made moves to drive Amin out of the other parts of the country not yet under control of the new government. 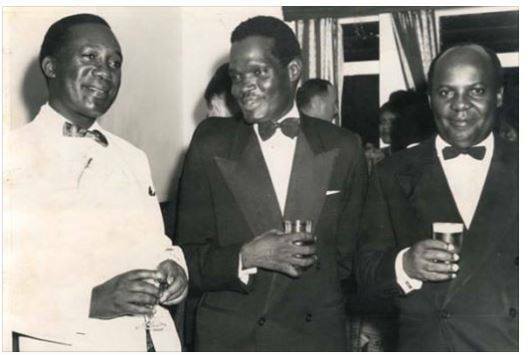 But TWO DEVELOPMENTS, not entirely of Lule’s or UNLF’s making, were taking place, never really ever been covered in detail by historians and commentators, that would have far-reaching ramifications for the political stability of Uganda and the socio-political re-engineering that would forever change things in northern Uganda. Ali while a section of Lugbara were not happy the Amin killed foreign minister Lt. Col. Michael Ondoga and the suspicious death of his wife Kay Adroa Amin, mother of Hussein Juruga Amin. All these were west Nile tribes supposed to have ‘enjoyed’ under Amin. Because Nubians were seen as beneficiaries and those who propped up Amin, they had to make quick arrangements to flee East Lango (Lira), West Lango (Apac), East Acholi (Kitgum) and West Acholi (Gulu) in a huff. Hence Shaban Ligu, the most prominent Nubian trader in Lira led the flight. Lira had a huge Nubian community and indeed Amin had set the infrastructure to build the second largest Mosque in Uganda near the current Lira hotel, where the unfinished structure still stands to date. The Nubians and West Nile Muslims were right to flee because the local population was in a very vengeful mood. For example, ABDALLA AMIN ORYONO, a local Lango Muslim in Apac who was seen as a confidante of the Amin local apparatus, was ‘picked up’ on 12th April 1979 as he walked the streets of Apac, Obote’s home town, lynched publicly and had his eyes gouged out before being stoned to death. He had probably never even met Amin in his entire life! His ‘crime’ was sharing a name with Amin and previously boasting of having been to Mecca. Whereas these despicable scenes of revenge killings took place having started somewhat spontaneously, they were seen as ‘acceptable’ because the locals were seen as ‘letting off steam’ for the trauma they had suffered under Amin for eight years. The Amin security had itself already poisoned the minds of the people because in the last three weeks leading to his fall, and probably quite aware that the government was heading for a fall, his State Research Bureau had gone on rampage rounding up dozens up businessmen and anyone of standing in Apac town, who were then ferried to Lira, never to be seen again. In fact by the day of the Amin fall, Apac was a ‘women’s and children’s only’ town as all remaining adult men had sort of ‘melted’ into the villages. The fall of Amin found me visiting my maternal uncle Abel Oyuru Aguru in Bar Odong, two kilometres from Apac. 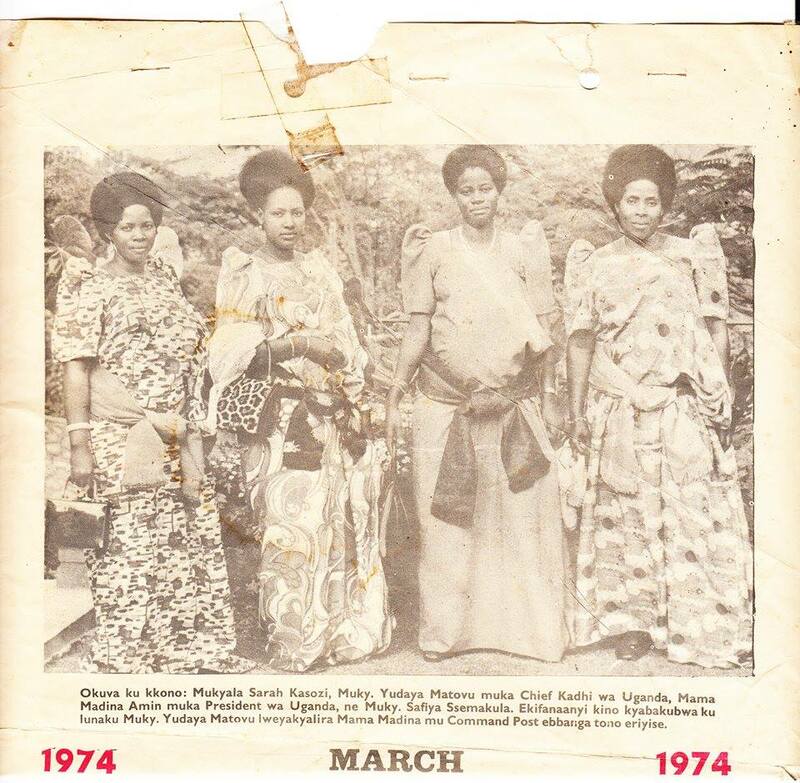 I was helping to tether the goats to feed that day near the roadside when a blue Peugeot 404 Saloon, full of soldiers in full combat fatigue came by and screeched to halt on the Apac-Akokoro road. My uncle, a former Obote I soldier who was coming back from his ‘hiding place’ where he had also been cultivating his garden, saw them from 100 metres away and thought the soldiers were stopping to try and arrest him! At his age of almost 50, he took off like a real athlete and later said he ran for nearly one kilometre before stopping! But it was false alarm as the vehicle was actually carrying Taban Amin and his bodyguards, who wanted to pick someone or something at his mother’s place in Ibuje (twenty kilometres on the Apac-Akokoro road), before proceeding to wherever he was going. Taban Amin’s mother Norah was from Ibuje and the person they met and stopped to talk to was his uncle. Because I actually do not want to comment or twist facts just to ‘tarnish’ Amin’s name as Hussein Juruga Amin and Edward Mulindwa had always implied, I will correct something that will make my brother George Okello unhappy; Amin DID NOT KILL HIS WIFE NORAH, as has been repeated in this forum by George and others. Maybe Amin divorced Norah or just separated because by the April 1979 fall of Amin, Norah was living in Ibuje. It was known that she was ‘traumatised’ and ostracised’ by locals for being a wife to person who hard ‘butchered’ Langi and caused much suffering to them. Norah in fact lived a quiet life, to a very ripe old age and died in December 2012 and was buried by Taban Amin and her other relatives in Ibuje. Taban Amin is alive, living and working in Uganda and can be contacted by anybody to and would tell whoever wished to know that he buried his mother only a couple of months back. The question is; Kampala was falling that day but why was Amin’s favourite son already hundreds of miles away fleeing. It meant Amin had already given up on winning the war days before the Tanzanians and Uganda exiles entered Kampala. Barely minutes after Taban Amin drove back or was driven back towards Lira, Radio Uganda announced that Amin had been overthrown. Understandably there was widespread jubilation. The day after Amin’s fall, I first learnt of the term ‘looting’, as people descended on any government office or stuff they could lay their hands on, starting with the ‘Foods and Beverages Depot’ which did not have much except for a certain alcoholic drink called ‘Red Top’ which people drank, got drunk and moved on to loot even the old recoiling type of telephone handsets and fire extinguishers from offices! 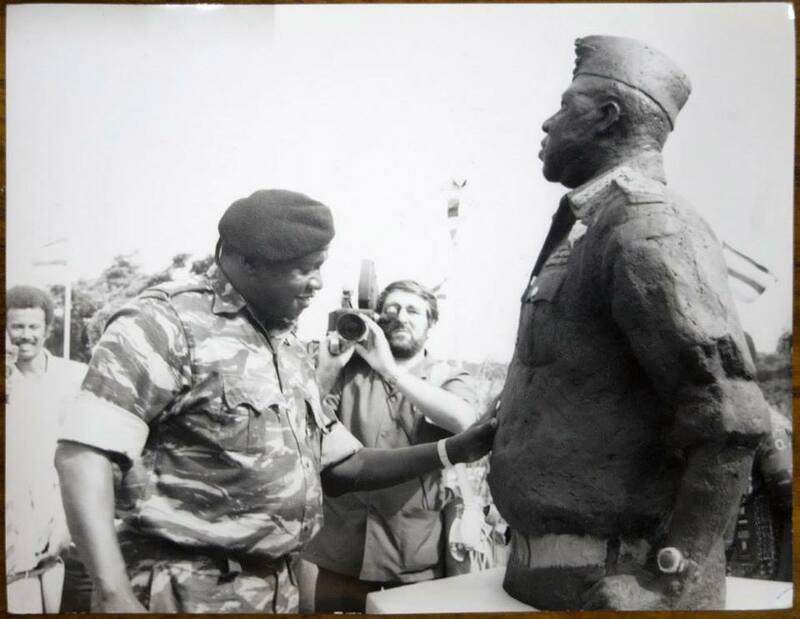 For reasons which became only obvious later, Idi Amin decided in late March 1979 to summon policemen from across the country to join in the war effort. Apac police sent out 20 of its thirty police officers to Kampala but barely one week later, they returned with their army uniforms, having taken no part in warding off the Tanzanian juggernaut. 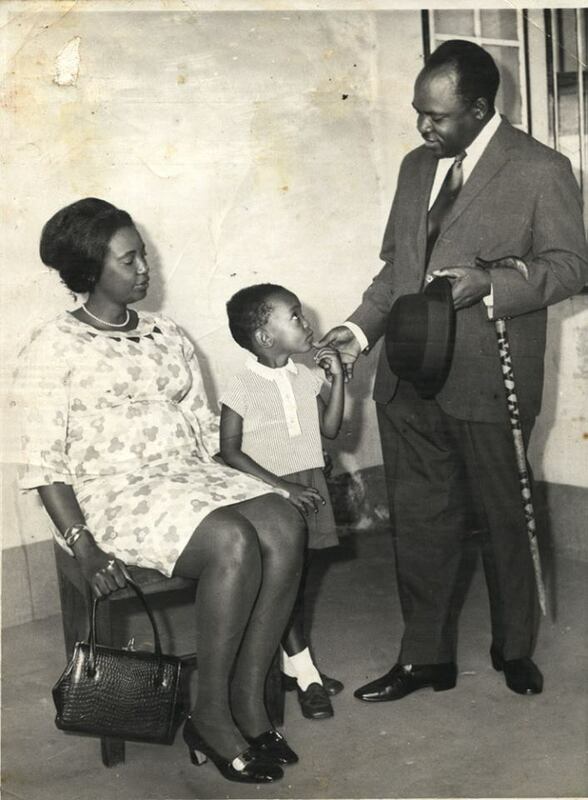 Idi Amin’s local boss of the State Research Bureau, Lt Philly Katema, who had coordinated the arrests of the local businessmen and prominent people only a few days earlier including his own boss the District Commissioner Karamuzi, found himself stuck in Apac, seemingly clueless. Karamuzi was luckily the only survivor among those taken to Lira by SRB and came back to Apac on foot, walking 55 kilometres through village paths and hiding in a village close to town until he was sure Assistant District Commissioner Katema was no more in Apac. Katema’s next door neighbour was the District Police Commander, a Mr Mpaulo from Busoga. On 13th April 1979, as Lule was being sworn-in in Kampala, a bearded gentleman called Adoko-Cuda walked casually to Apac police station, followed by four other people, one of them carrying a sack. He asked for the keys to the police armoury and when the police officer on duty asked him why, he gave him one hot slap, his other friend pulled out G3 gun and the policeman promptly led them to where the weapons were. They took them as they were joined by about ten others; and proclaimed themselves the local liberators! They then rather stupidly, proceeded towards Katema’s house just two hundred metres away, tried to approach it from the front and Katema fired in the air towards their direction using a stuttering rapid fire gun; they fled and hence began a cat-and- mouse game that lasted three days until Katema was smoked out of his house on the very early morning of 15th April, 1979. The District Police Commander who came out to find out what was happening at Katema’s house was also shot dead. The bodies of the two men were taken in a government pickup commandeered by the group, driven to Ibuje and dumped on the east side of the Ibuje Mountains. I recently was surprised to bump into a Ugandan Munyarwanda called Emma Masumbuko who lives around Lugazi and said he is Katema’s relative but never knew what happened to the SRB man. Now he knows. Masumbuko is an avid supporter of local football club SC Villa. The local ‘liberators’ considered Apac liberated, and started hit and run and ambush operations against Amin troops fleeing up north using the various local roads in the Lango sub-region. Two weeks into Lule’s presidency, something rather ugly started happening, never before publicly acknowledged but which may have set the tone for events in future. 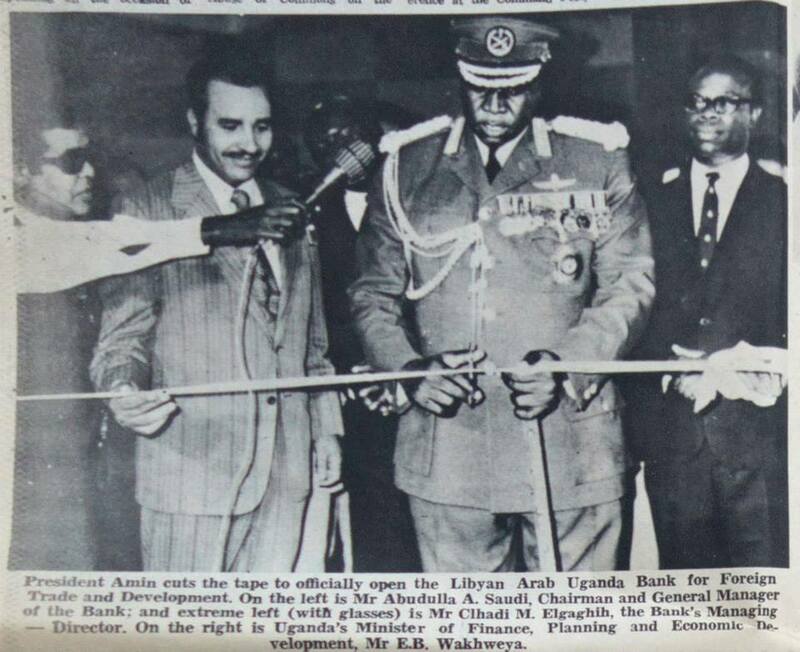 Binaisa (R) with Yusuf Lule on the left who had introduced a bank for Africans in 1959.4th President, 4th Prime Minister, and 5th President. The months of March and April are usually the start of the rainy season and in these areas and it means also the time for plentiful harvests of the various families of wild mushrooms that the locals cherish. It so happened that for decades, Bahima cattle keepers, known popularly as Balalo or locally in Lango and Acholi as Olari, had settled in Lango and Acholi and many of them worked as hired tenders of cattle, with services paid for in cash or kind by the cattle owners in many parts of Lango and Acholi. With time they amassed their own herds and many separated from their former bosses and started their own kraals or simply moved nomadically with their cows around the region. Many were in the sub counties of Ibuje, Akokoro, Chawente, Nambieso, Aduku, Inomo, Teboke, Loro Kwera, Namasale, Muntu, Awelo, Awelo, Amolatar and elsewhere in Lango and Acholi. After the initial looting of any government property in the hours and days after Amin, the looters ran sort of what to plunder and having tasted new found freedom against authority, decided that after all the Balalo cows constituted an item for looting since the owners amassed them in these regions anyway. Nearly all Balalo cows were looted, and fortunately hardly any of the victims reported killed, with the rest of the victims fleeing to neighbouring districts in Bunyoro, Buruli and Busoga. It was the first injustice really, against a people who in fact seemed to have nothing at all to do with Amin’s tyranny. The looting of Balalo cattle was nicknamed by locals as ‘Puto Obwol a Lule”, or “harvesting Lule’s mushrooms”. It was yet another dark episode in the history of the country’s political instability. The victims never got redress nor acknowledgment of this injustice from all subsequent governments. Among those who lost hundreds of cows were said to be two uncles of one Elly Tumwine, the future head of the NRA, the government army, as well as relatives of many other people who were later to become prominent in Uganda. Just as the Balalo fled Lango and Acholi, the Karamojong also suddenly disappeared, stealthily going back to Karamoja without alerting their employers. Many families had also employed Karamojong cattle keepers to tend to their cows but the Karamojong never really cared about amassing their own herds and only wanted milk and money to continue working for years. A few months after the fall of Amin, after Lule had already been overthrown and after the Karamojong had apparently looted a full armoury at Moroto Barracks in the aftermath of Amin’s fall, a new term entered the vocabulary of the region; cattle rustling. It was initially limited to Olilim, Amugu and Otuke in East Lango, present Lira Otuke and Alebtong districts. In fact before being deployed by Chief of Staff David Oyite Ojok to beef up the Obote faction of the UNLA in Kampala, the local Lango militia which started from scratch that morning in Apac and grew into a bigger force, was first deployed to fight the Karamojong cattle rustlers, known as ‘Alok’ in eastern Lira and many got killed there at the hands of rustlers who in fact now had their own ‘field commander’ named ‘General’ Apalolirisi Lotyang. Karamojong cattle rustling were eventually subdued under Obote II, after negotiations with some Karamojong leaders and elders but the rustlers were never disarmed. The rest of the story is known then fast forward to 1987. The new NRM government had been in power for hardly a few months when they were confronted by multiple rebellions in Acholi, Lango and Teso. The rebellions were two-faced in nature, in Acholi and Lango. Former UNLA fighters returned from their exile in Sudan to start a full scale war in August 1986 while Alice Abongowat Auma also started her ‘Holy Spirit’ war immediately with full scale conventional attacks. Those in Lango never really cared about the rebellion in Acholi as many still blamed the Acholi for the fall of the Obote II government. Down in Lango, there arose two types of rebellions, lacking central leadership and just almost a copycat reaction to the Acholi rebellion. Because the Lango rebellion lacked central command and was led at a localised level with leaders like former Jinja District Commissioner Wilson Okot Chono, Otim Opul, Emmanuel Amute and Okello Etot of Kamdini from their different locations, it did not even have a name, so they became known to locals as ‘Olum Olum” or ‘Bushmen”. One telling aspect was that very few or none of the Lango army officers who ‘fled’ home after the Okello coup was interested in the local rebellion. All the above leaders who appeared to lead the rebellion in different areas were actually local UPC leaders, businessmen or opinion leaders. The other element of the Lango rebellion was really localised thugs, who had guns and felt the adrenalin to do things, rob people and pretend that they were fighting Museveni. This group was known as “Cel Ibong”, a euphemism which translates roughly as “shoot dead and rummage through the victim’s pockets for something to steal” and was also known in some parts ‘Wia pe” or “I am crazy” or “don’t joke around with me because I am nuts”. As the Lango rebellion went on, Karamojong cattle rustlers resurfaced, with more ferocity. Te highly mobile and fast moving groups not only looted cows in Lira but went as far as Apac. It soon dawned on people that the Karamojong were benefitting from an excellent spy system because they knew who owned which kraal and many times called out and humiliated the owners by calling out for example that “Daudi, dyangi titidi, bin imedi sente iye” or “Daudi, the cows are quite few, come out and add more money to us besides the cows”. It soon became apparent that the Karamojong cattle keepers from the 1970s and early 1980s who ‘disappeared’ and went back home were leading and directing the raids. NRA’s response was rather lukewarm, as the army told local leaders that though they were the government army; they still largely moved on foot and lacked transport for rapid deployment to counter the raiders or to rescue the cattle. There were some ambushes and attacks against the raiders and cows were recovered though some soldiers were accused of stealing the recovered cattle. Indeed I remember Lira Brigade Intelligence Office one JOII Fred Toolit (current Brigadier Fred Toolit), arresting some soldiers and having them tried publicly, in an effort overseen by his boss SO Stanley Muhangi. Still there was a simmering suspicion that the NRA initially did not do much to stop the cattle rustling. Indeed some NRA officers had argued that their priority was stopping the rebellion and dealing with cattle rustling problem later. Later, one Lango politician intimated that since many NRA commanders were Banyankole, they may have turned a blind eye to Karamojong cattle rustling in Lango as ‘payback’ for the cattle the Langi stole from the Balalo in 1979. There has been no empirical proof that this was the. I am a not a Mulalo nor Munyankole but while I appreciate that government is compensating people in Lango, Acholi and Teso for cattle that were stolen by largely Karamojong and local rebels, the same good gesture in correcting ‘historical injustice’ should have been extended to those unfortunate Balalo. Problem is that many have since died and even if survivors exist, perhaps they don’t care anymore since they settled elsewhere and rebuilt their lives. It is however heartening to see Balalo back in Lango and being treated well. Of course, back to the Lango rebellion, earlier mentioned, it soon petered out as NRA established itself in parts of Lango, with a brigade headquarters based in Lira. The army had to contend with Lakwena, Kony and the Teso rebellion. The Lango rebellion simply melted away, indeed despised by the locals, most of whom nevertheless did not like Museveni and the NRM at the time that much.